That's my post at Vision & Verb today in commemoration of America's Memorial Day. I'll call in to V&V a little later, Ginnie. Perfect for this day. And, indeed, why. I'll read the V&V post later, once it's up for me. Ginnie Hart: Thank you, Elizabeth. We keep asking WHY forever, it seems, and nothing ever changes!?! Ginnie Hart: Thank you, Peter. I immediately thought of Memorial Day when I saw it. A question we ask for ever - also now while looking at different parts of the world ...Later I'll read your V&V tribute. Ginnie Hart: A forever-question, Philine, often with no satifactory answer, it seems! Thank you. Ginnie Hart: I know, Lisl. It's very sad and not what we expected, I'm sure, when we arrived in this world. Ginnie Hart: So sad but true, Chris! Ginnie Hart: So sad but probably true. I hate it, Oscar. Excellent and very appropriate for today Ginnie! Camaraderie is probably about the only positive aspect to come out of wars. We remember our heroes in November. Ginnie Hart: A Band of Brothers...and Sisters! Yes. Fine words on your Vision and Verb blog. Food for thought! Ginnie Hart: If you don't mind, Alan, I will add this as a comment there?! "Anything that encourages the growth of emotional ties will operate against war." Ginnie Hart: I don't know if this means you read the V&V post, Mike. If not, it is coincidental that you would be quoting Freud here! I would love to post this quote at V&V, if you don't mind? Ginnie Hart: Yes, indeed, Bill. Apparently never answered! Ginnie Hart: I agree, Joshi. Thanks. Really good question, Ginnie - and no rational answer! Ginnie Hart: So sad but true, HF. That is the best question Ginnie. Ginnie Hart: The question with few/no answers, it seems?! We will always wonder...and asking why and there will be never an answer. Ginnie Hart: Wars and rumors of wars...all throughout history. Has anyone ever had total peace? Bedankt, MLMA. We have learned nothing. Greed still overpowers all. Ginnie Hart: Sad but true, I'm afraid, Mary! Great image with the... >Why? The picture is an evocative one. But the short answer to "Why?" is that many people are power hungry. They can blow their bellows any which way, but in the end it is about power. Ginnie Hart: I hate it, Louis, but I'm sure you're right! President Obama is being criticized by the Right for seeking diplomatic solutions to conflicts. They call him weak on foreign affairs. What a bunch of hogwash. Only wish that all heads of state would follow his lead. War is hell! Ginnie Hart: I couldn't agree with you more, Beverly. Would you mind if I added this comment to the V&V post??? Ginnie Hart: I know what you mean about the post, Brian. Why haven't we learned from all those years ago???? Enjoy your kiddies while you have them! A poor broadband connection is not helping me today. 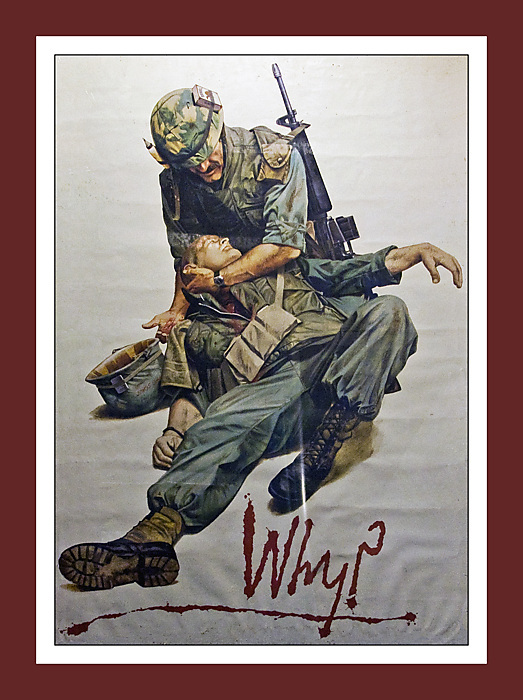 Why war? Our governments decide why, we just have to go along with it. It is always about power and greed. And due to the power and greed, leaders get out of control! Ginnie Hart: It sounds like we need an uprising to protest???!!! !